Outdoors 720: Surfing with a shark: Does this photo show a great white with surfers? 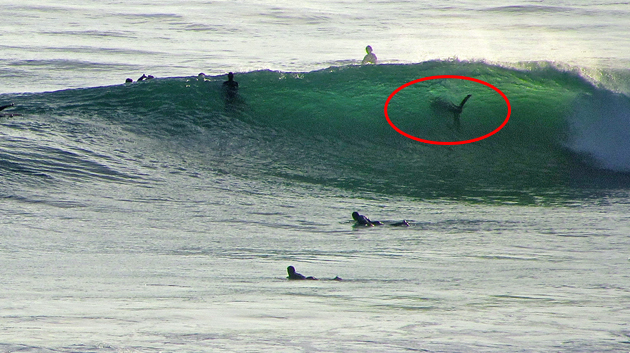 Surfing with a shark: Does this photo show a great white with surfers? 1.) A lifeguard who saw the photo said it looked like a surfer paddling through a wave, as when surfers duck under waves. 2.) The photographer, Gary Elliott, said it doesn't look like a surfer and that it isn't the silhouette of a surfboard. He called it a sea creature in the below video with KFMB-TV in San Diego, though it's apparent he believes it to be a shark, a great white according to the news report. 3.) A shark expert in the news report said it looks like the tail end of an animal 10-12-feet long heading out to the sea, though off-camera he apparently called it a great white shark. 4.) In the previous week, there had been reports of shark sightings along a two-mile stretch of the San Diego coastline. In fact, there were reports Thursday morning of a 12-inch fin being sighted within 200 yards off shore in the Point Loma-Ocean Beach area, though it wasn't confirmed. So, what do you think? Is this photo taken at Swamis Beach in Encinitas, Calif., a surfer? Or a great white shark? Here's a link to the news report from CBS 8 in San Diego. Elliott captured the image on Wednesday at Swamis Beach. It wasn't until he returned home and studied the photo that he discovered the surfing shark. Or the surfer with strange feet. UPDATE: One expert suggests it might have been a bottlenose dolphin surfing sideways. Check this story out at GrindTV Outdoor. UDPATE II: Another post that disputes the authenticity of the great white shark in this photo comes from LukeTipple.com. This one comes with its own Photoshopping. Great stuff! I surfed there at the exact time and date the pic was taken. Good south swell was coming up quickly!! Someone on the beach said something about ...."away from the ocean...." that I didn't understand before I paddled out. I heard some stories about a big fish being there in the lineup after surfing. Me personally I did not see anything special as long as I was surfing.... but that needn't mean anything. Anyway, the shark test was positiv: Stick your finger in the water, if it tastes salty sharks are around :-) true, eh...! !